I wanted to drop you a line to say a big thanks to Eddie and his team for all the care and attention they gave me when replacing my front tooth with a root canal and crown. Root canal treatment is a highly effective dental procedure which is commonly used in dentistry to save a tooth where an infection is present. Once the infection reaches the pulp chambers within the tooth the only options for treatment are between a root canal treatment or extraction. We recommend to all our patients if they can possibly afford the financial outlay to save a tooth rather than extract. Root canal treatment is a general dental procedure. Once the infection has spread to the pulp chamber of the tooth, the tooth will slowly start to die causing extensive pain in certain cases or an abscess to form. A root canal treatment will ease this infection by removing the infected nerve and treating the infection. Sometimes a course of antibiotics is necessary before treatment commences. Local anaesthetic will be used to numb the tooth and surrounding area. We will make an access point into the tooth to enable us to remove the decayed pulp tissue. 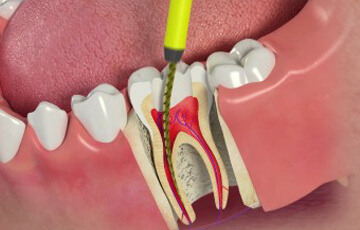 Once the tooth is cleaned the roots are then sealed. In many cases a white filling or a crown in placed to restore the tooth after treatment. Root canal treatment is a skilled and time consuming procedure and most courses of treatment will involve more than two visits. However the time is greatly worth it for the patient to preserve the tooth without having to consider an extraction with a possible gap.